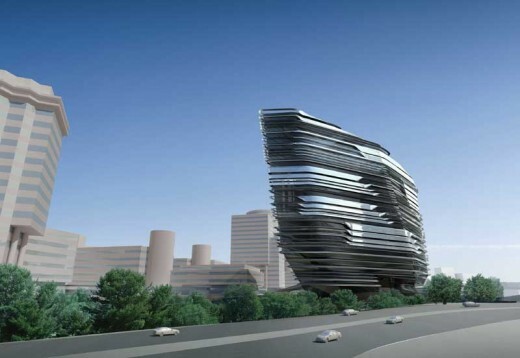 Zaha Hadid Architects’ new 15-storey building is to be officially opened on 18 March 2014. The 76m-high leaning building has been partly in use since September 2013. It will provide a space for more than 1500 university students. The Hong Kong Polytechnic University (PolyU) has topped out the Jockey Club Innovation Tower on its campus in Hong Kong. The building design is by architecture practice Zaha Hadid Architects, based in London. The 15-storey tower will become the new home for the PolyU School of Design and the newly-established Jockey Club Design Institute for Social Innovation. The Innovation Tower building will be 76m high. Planned as the university’s design school, the building is close to Hung Hom station in Kowloon. The design of the 15,000 sqm building is typical for Zaha Hadid with its seamlessly fluidic structure. The PolyU building is being built at the northeastern corner of the Hong Kong Polytechnic University campus. The facility will offer space for 1,800 staff and students and will house a lecture hall, 10 classrooms, design studios and workshops as well as a design museum, exhibition space and a communal viewing lounge. Construction of the facility is partly funded through a donation of $249 million from the HKJC Charities Trust. Construction on the scheme began in 2009 and is due for completion by mid-2013. 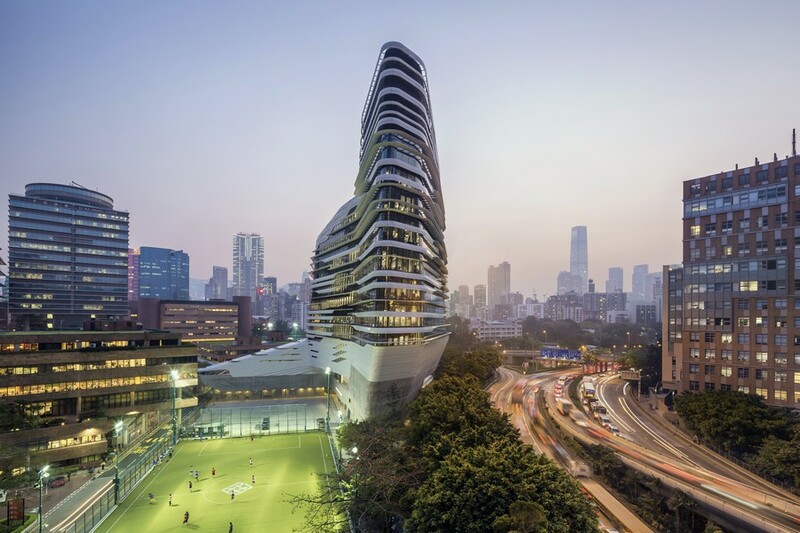 The Hong Kong Polytechnic University (PolyU) has appointed world-renowned architect Zaha Hadid as Chief Architect of its new “Innovation Tower”. Zaha Hadid has made a trip from London to Hong Kong to present her design concepts at a press conference hosted by Mr Victor Lo Chung-wing, Chairman of PolyU Council; and Mr Alexander Tzang, Deputy President of PolyU. Addressing the press conference, Mr Victor Lo said PolyU’s new “Innovation Tower” will serve as a driving force in the development of Hong Kong as a design hub in Asia. The new Tower will also provide additional space to facilitate inter-disciplinary research and education in the field of design. The new PolyU Tower will be located at the northeast side of the Hong Kong Polytechnic University campus. Construction work will begin in 2009 and the whole project is expected to be completed by 2011. Upon completion, the Innovation Tower will provide some 12,000 square metres of net floor area and able to accommodate more than 1,500 students. This Tower will be the first permanent architectural design in Hong Kong by Zaha Hadid. “I am delighted to be working in Hong Kong again. The city has such diversity in its landscapes and history; this is reflected in an urbanism of layering and porosity. Our own explorations and research into an architecture of seamless fluidity follows this paradigm so evident in Hong Kong. One of our seminal projects was designed for the city exactly 25 years ago, and the Innovation Tower design is a realization of this continued research.” states Zaha Hadid. Zaha Hadid is one of the most influential figures in the world of modern architecture. She is also the first female recipient of the coveted Pritzker Architecture prize, which is known in architecture as the equivalent of the Nobel Prize. She established her professional practice in London and her architectural designs can be found in major cities around the world. These include the BMW Central Building in Leipzig, Germany; the National Museum of 21st Century Arts in Rome; and the Olympics Aquatics Centre to be built in London. PolyU Deputy President Mr Alexander Tzang added that the University has gone through stringent procedures in selecting Zaha Hadid as Chief Architect of the project. The University has appointed a 10-member selection panel to screen some 48 submissions from local and overseas architectures and short-listed five proposals, taking into consideration both technical feasibility of the project and cost. The new Tower will house the School of Design (SD) and support the development of its specialisms, namely Environmental Design, Industrial and Product Design, Visual Communication, Advertising as well as Digital Design. It will provide a congenial environment to support SD staff and students in their pursuit of excellence. In this new “Innovation Tower”, there will be an advanced Car Design Studio; Fashion Accessories Materials Labs; a Sound Studio for Multi-media and Entertainment Design; a Museum to showcase local and international design classics; and a public gallery to exhibit works of staff and students of SD as well as local talents. In Hong Kong, PolyU is the sole provider of design tertiary education and the city’s most important hub of design education and development. In recent years, SD has scaled new heights under the directorship of Prof. Lorraine Justice, who was named as the world’s top 40 influential designers by the ID magazine in the US. SD has also made its mark, for two consecutive years since 2006, as one of the top 60 design schools in the world, according to independent surveys of design schools and design programmes conducted by BusinessWeek. Design talents groomed by PolyU have won worldwide recognition and achieved astounding successes with their creativity and innovations. Famous graduates of SD include Oscarwinner and Supervising Animator for Shrek Mr Raman Hui, founder of the jewellery brand Qeelin Mr Dennis Chan, and Partner of Kan & Lau Design Consultants Mr Freeman Lau, to name but a few. Famously architect Zaha Hadid did one of her earliest building designs for The Peak architecture competition in Hong Kong.